This 100% polyester fleece hunting vest, marketed by Cabela's, is available in either plain blaze orange or a Blaze Horizon camo pattern. I am not a fan of blaze orange, as it is highly visible to animals as well as humans. (Yes, even color blind animals like deer can spot blaze orange due to its unusual reflectance.) 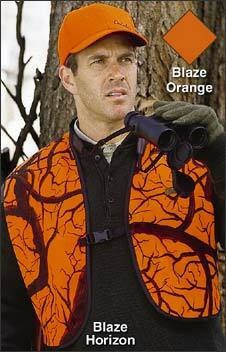 Unfortunately, blaze clothing is required in many locales for big game hunting. If you have to wear blaze orange, breaking-up the blaze area seems like a wise idea to me. This Blaze Horizon vest does just that with a pattern of branches printed over the blaze vest. This is purely a "hunter safety" vest, as it incorporates no storage pockets or other frills. I bought it to wear over my mossy oak break-up hunting parka during deer season. There is a Fastex type buckle at the front to keep the vest closed. Retail price at Cabela's is $16.95 in sizes S, M, L, XL and $19.95 in sizes 2XL and 3XL. The sizing is generous. I ordered size "Large" as that is the size of my hunting parka, and the vest fits over the parka perfectly, without binding or interfering with my movement. Care of the vest is easy. Machine wash in warm water and tumble dry on low heat. The seams are double stitched, so hopefully they will stay together for at least a few hunting seasons. This product is manufactured in Vietnam. Frankly, if I'd known that before ordering, I'd have purchased another vest. I see no reason to support one of the last hard-line (and most repressive) Communist governments in the world, but for those of you who are young enough to have no hard feelings towards the totalitarian government of Vietnam, this will not be a problem. Regardless of where it was manufactured, this fleece vest does what it is advertised to do. It is quiet in the woods, unlike the cheap nylon blaze vests you see for sale during hunting season. It exceeds 600 square inches of high visibility blaze orange. The camo pattern usefully breaks-up the orange background. The 3/4 design allows easy access to the pockets of your parka. Customer reviews on the Cabela's web site (www.cabelas.com) claim that the vest is durable and fade free after hard use. All in all, it seems to be a pretty good product.